Looking for the perfect rainy afternoon idea? Do you know how to make a hovercraft? It’s an easy science project you can do using things you have at home. Grab the top from an empty sports top bottle (and clean it!). Then use crazy glue to glue it over the hole in an old CD. Put the glue around the edges of the bottom of the top, and then center the top over the hole in the CD, and glue it down. Once it is dry, pull the sports top up grab a balloon, blow it up and pinch it to keep the air in. Then put the balloon top over the sports top, and watch the air go through the sports top. As the air leaves the balloon, it will move the CD! Another fizzing rainbow idea – try a gold coin hunt! Get our free Play Pack – for simple play ideas (including more simple science activities) when you subscribe to our newsletter here. 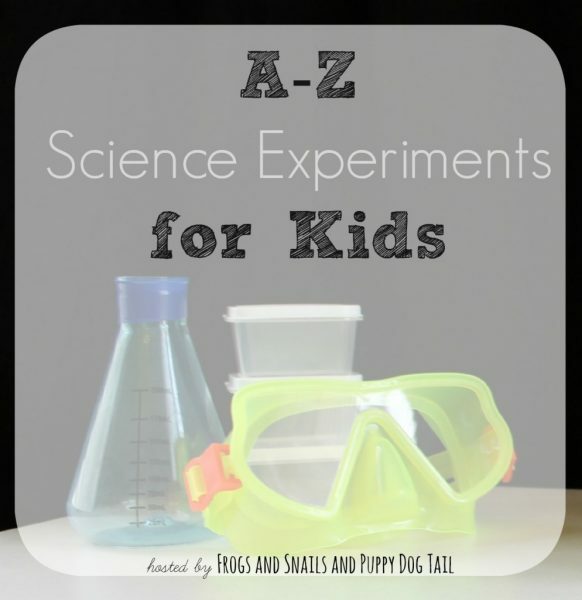 This post is part of the A to Z Science Series on Frogs and Snails and Puppy Dog Tails. Click on the photo below to see all the rest of the posts!